J.K. Casey. 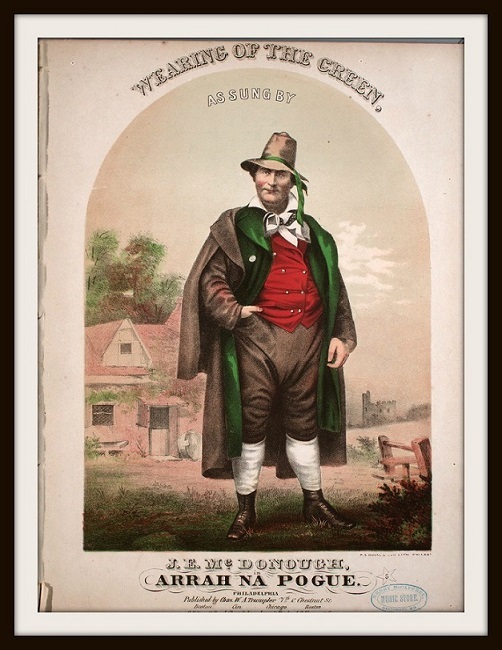 There are many versions of 'The Wearing Of The Green' . The one I have put the chords to is the one that's most popular in Ireland. The video is of The Wolfe Tones, the tune itself is similar to another Irish song ''The Rising Of The Moon'' , same air but different words. J.K. Casey was sometimes called ''Leo'' . An Irish rebel song. The ukulele chords are now included. O[D] Paddy dear, and[Bm] did you hear the[A] news that's going round? The[G] Shamrock is for[D]bid, by laws, to[A] grow on Irish[D] ground! For, there's a[G] bloody[D] law agin the[A] Wearing[A7] of the[D] Green! And he says: How is Poor Ould Ireland, and does she stand? For, they are hanging men and women for the Wearing of the Green! Ould Ireland's sons will ne'er forget the blood that they have shed.. It will take root, and flourish still, tho' under foot 'tis trod. When the law can stop the blades of grass from growing as they grow..
And when the leaves, in Summer time, their verdure does not show.. But, till that day, plaze God! I'll stick to the Wearing of the Green! Where rich and poor stand equal, in the light of Freedom's day! O Erin! must we leave you driven by the tyrant's hand! But where, thank God! we'll live and die, still Wearing of the Green! One blessing on my native Isle! Old Erin and her faithful sons, that loved to wear the green. Thy faithful sons will fondly sing "The wearing of the green." If I had proved a traitor to "The wearing of the green." Her faithful sons will ever sing "The wearing of the green." O[G] Paddy dear, and[Em] did you hear the[D] news that's going round? The[C] Shamrock is for[G]bid, by laws, to[D] grow on Irish[G] ground! For, there's a[C] bloody[G] law agin the[D] Wearing[D7] of the[G] Green!. O[C] Paddy dear, and[Am] did you hear the[G] news that's going round? The[F] Shamrock is for[C]bid, by laws, to[G] grow on Irish[C] ground! For, there's a[F] bloody[C] law agin the[G] Wearing[G7] of the[C] Green!